Dasypeltis sahelensis. Sidi Ifni (Morocco). Photo: © Baudilio Rebollo Fernández. 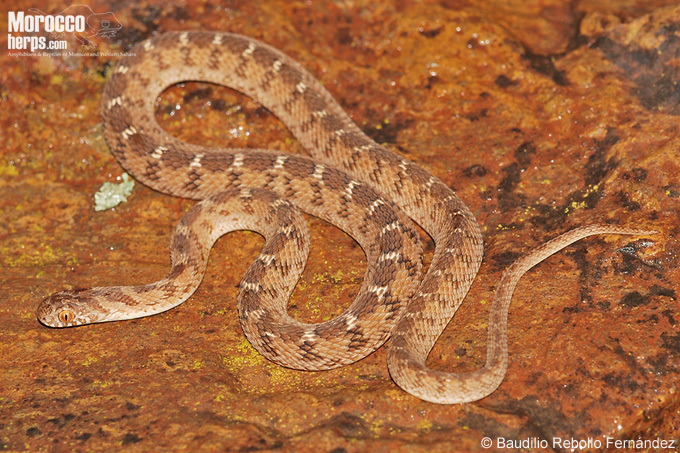 Daniel Escoriza (2012): Dasypeltis sahelensis Trape & Mané, 2006. In: Martínez, G., León, R., Jiménez-Robles, O., González De la Vega, J. P., Gabari, V., Rebollo, B., Sánchez-Tójar, A., Fernández-Cardenete, J. R., Gállego, J. (Eds.). Moroccoherps. Amphibians and Reptiles of Morocco and Western Sahara. Available from www.moroccoherps.com/en/ficha/Dasypeltis_sahelensis/. Version 17/10/2012. Accessed 25 Apr 2019. Español: Serpiente comedora de huevos del Sahel. Français: Serpent mangeur d'oeufs du Sahel. Global range map of Dasypeltis sahelensis. 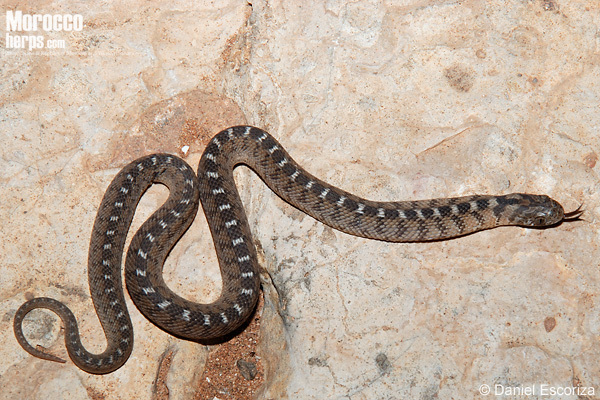 The genus Dasypeltis is formed by 12 species (Spawls et al. 2002; Chippaux 2006; Trape & Mane 2006; Trape et al. 2012) occurring mainly in the Afrotropical region. Outside this region appear two species, D. scabra scabra, which occurs in southwest Saudi Arabia and Yemen (Egan 2007) and Egypt (Anderson 1898; Sochurek 1981) and D. sahelensis that appears in southern Morocco and Western Sahara (Schleich et al. 1996). The genus Dasypeltis is comprised within the Colubrinae subfamily, and is related to other African genus of opisthoglyphous snakes, as Toxycodrias and Telescopus (Lawson et al. 2005), although the teeth in Dasypeltis are poorly developed. Until recently Sahelian populations of genus Dasypeltis were assigned to D. scabra but Trape & Mané (2006) proposed the existence of three species in the western Sahel region (D. sahelensis, D. confusa and D. gansi) based on variability of color patterns, whose validity has been confirmed in subsequent molecular analysis (Trape et al. 2012). In Morocco appears D. sahelensis, which showed little genetic divergence compared to populations located south of the Sahara (Trape et al. 2012). The type locality of the species is Tialé in Senegal (Trape & Mané 2006). It is a small sized snake, with an average size of 500 mm. The head is slightly differentiated body, with proportionally large eyes with vertical pupils. The snout is rounded, presenting seven supralabials, being the third and fourth in contact with the eye. The body is slender, covered with keeled scales, presenting 21 rows in the middle of the body. The tail is indistinct. The background color (based on Moroccan specimen) is orange-brown, with a black vertebral line interrupted by white blotches, arranged regularly in ladder-like pattern. The belly is yellowish white, without spots. The irises are orange and brown, with a striking V-shaped design behind the eyes, which extends above the parietal scales. Head. Sidi Ifni (Morocco). Photo: © Baudilio Rebollo Fernández. This coloration could mimic Echis leucogaster, a viperid with similar geographic distribution. In Ethiopia it has been proposed that D. scabra may show Batesian mimicry with Causus rhombeatus (Largen and Spawls 2010). According to other authors coloration may vary depending on the type of small local viperids (Gans 1961). 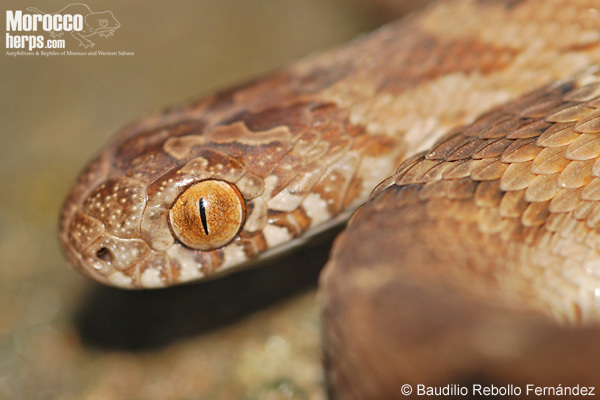 The combination of the following characters: short and rounded head, large eyes and vertical pupils, along with the dorsal keeled scales and vertebral design alternating spots and white, making it difficult to confuse with other local species of snakes. A nocturnal species, showing activity even on rainy nights. There is little information on its ecology in Morocco. I've been able to find at late October neonates and active adults in spring. Like other species of the genus is oophagus, feeding exclusively on bird eggs. The species of this genus feed only during the bird breeding season and can survive months without feeding. D. sahelensis is mainly distributed in the western Sahel (Senegal, Mali, Niger, northern Nigeria and Burkina Faso), there being a relict population in the south of Morocco and Western Sahara. In Morocco and Western Sahara appears in the region between Agdz, Agadir and Ahel Brahimat (Bons & Geniez 1996; Geniez & Guillod 2003; Geniez et al. 2004; Barnestein et al. 2010; Escoriza 2010). Sahelian populations and the located in the north of the Sahara is unlikely that they are connected (Escoriza 2010). Juvenil. Sidi Ifni (Morocco). Photo: © Daniel Escoriza. In Morocco this species is mainly distributed in the Mediterranean oceanic desert bioclimatic belt, with an annual average temperature around the 18.9 °C, and an average precipitation between 45-214 mm / year. The potential vegetation is shrub formations of Euphorbia (tabaibal-cardonal), and sabanoid forest of Argania spinosa. In this region of Morocco occur other Sahelian snakes, as Bitis arietans, Echis leucogaster and Boaedon fuliginosus (Schleich et al. 1996). Habitat. Sidi Ifni (Morocco). Photo: © Gabri Mtnez. These snakes could have crossed the Western Sahara favored by more humid conditions during the Holocene (6000-9000 years ago), when the western Sahara desert was covered with steppes of Artemisa (Claussen et al. 2003). The low niche differentiation showed by populations of these species located at both sides of the Sahara (Escoriza 2010) and their low genetic differentiation (Trape et al. 2012) support this scenario. D. sahelensis seems to be one of the rarest reptiles of Morocco. Possibly this rarity is real, but also the discrete habits of this species (being up to 11 months inactive) make it very difficult to detect. 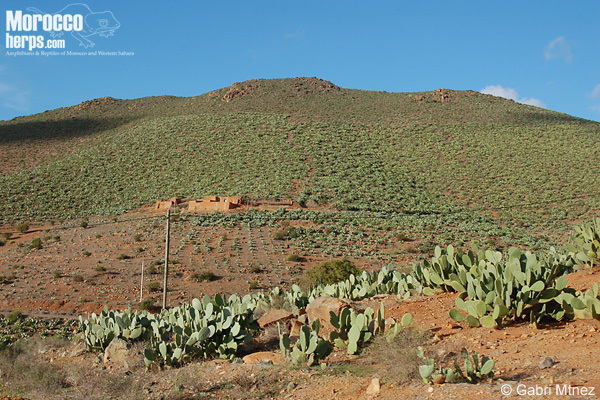 The intense grazing that is suffering this region of southern Morocco is a negative factor that can affect the conservation of this relict snake population. Anderson, J. 1898. Zoology of Egypt.I. Reptilia and Batrachia. B. Quatrich, London. 371 pp. Barnestein, J.A.M., Gónzalez de la Vega, J.P., Jiménez-Cazalla, F., Gabari-Boa, V. 2010. Contribución al atlas de la herpetofauna de Marruecos. Bol. Asoc. Herpetol. Esp. 21: 76-82. Bons J., Geniez, P. 1996. Amphibiens et reptiles du Maroc (Sahara Occidental compris). Atlas biogéographique. Asociación Herpetológica Española,Barcelona. 319 pp. Chippaux, J.P. 2006. Les serpents d'Afrique occidentale et centrale. IRD éditions, Paris. 311 pp. Claussen, M.& Gayler, V. 1997. The greening of the Sahara during the mid-Holocene: results of an interactive atmosphere-biome model. Global Ecology and Biogeography Letters 6: 369–377. Egan, D. 2007. Snakes of Arabia. Motivate publishing, Dubai. 208 pp. Escoriza, D., 2010. Ecological niche modeling of two Afrotropical snakes: is the Sahara desert a true barrier for these species? Rev. Esp. Herpetol. 24: 93-100. Gans, C. 1961. Mimicry in procryptically colored snakes of the genus Dasypeltis. Evolution 15: 72–91. Geniez, P.; Mateo, J.A. ; Geniez, M. & Pether, J. 2004. The amphibians and reptiles of the Western Sahara (former Spanish Sahara) and adjacent regions. Edition Chimaira, Frankfurt. 228 pp. Largen, M.J.; Spawls, S. 2010. Amphibians and Reptiles of Ethiopia and Eritrea. Edition Chimaira, Frankfurt.694 pp. Lawson, R., Slowinski, J. B., Crother, B. I., and Burbrink, F. T. 2005. Phylogeny of the Colubroidea (Serpentes): new evidence from mitochondrial and nuclear genes. Mol. Phylogenet. Evol. 37, 581–601. Schleich,H.H., Kästle,W., Kabisch, K. 1996. Amphibians and Reptiles of North Africa. Koeltz, Koenigstein, 627 pp. Sochurek,E. 1979. Die Schlangen Nordafrikas. Mitt. Zool. Ges. Braunau 3 (8/9): 219-226. Spawls, S., Howell, K., Drewes, R., Ashe,J. 2002. A field guide to the reptiles of east Africa. Natural World, Hong-Kong. 544 pp. Trape, S., Mediannikov, O., Trape, J.F. 2012. When colour patterns reflect phylogeography: New species of Dasypeltis (Serpentes: Colubridae: Boigini) from West Africa. Comptes Rendus Biologies 335(7): 488-501.